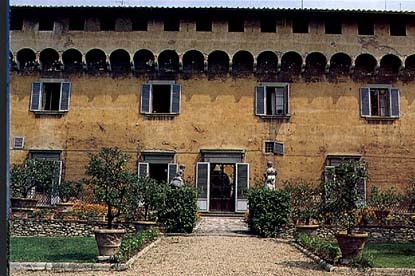 The villa originally belonged to the Lippi family and was modified around the mid-fifteenth century by Michelozzo for Cosimo the Elder; who chosed it as his favorite residence. Despite Michelozzo's Renaissance modifications (particularly fine is the small irregular inner court), the building still maintains its original aspect of fortress in the imposing crenellated tower. It was in this villas, formerly the seat of'the famous Florentine. PlatonicAcademy, that the illustrious philosophers (Pico della Mirandola, Marsilio Ficino) and artists (Donatello, Brunelleschi, Alberti) used to meet. And it was here that Cosimo the Elder died in 1464 and Lorenzo the Magnificent in 1492.